When did you last have a ‘date night’ with your partner? Like real, quality time together just the two of you? We all know how important it is to spend time together as a couple away from the kids but finding the energy or inspiration to do anything other than sit in front of the telly with a takeaway can often feel like too much of an effort. If this sounds like you, I know someone who can help put that spark back into your date nights. Let me introduce you to Kate Greenhalgh, mum to two-and-a-half-year-old Phoebe and and wife to John. Kate has got your date nights covered, I promise. Two years ago, inspired by a gift from her (very clever!) husband, Kate set up A Year Of Dates – beautiful gift boxes packed full of unique, colour-coded date ideas for you and your partner to enjoy together. There are plenty of other brilliant gift ideas too – A Year Of Play for little ones (perfect for school holidays if you’re stuck for ideas), milestone boxes for those big birthdays, and the fab just-launched New Parents box. Even though she’s super busy, Kate made time to have a little chat with us so that we could find out more about her, her family and the lovely story on how A Year Of Dates came to be. Hopefully it will inspire you to turn off the TV for an hour and make proper date nights a regular thing again. 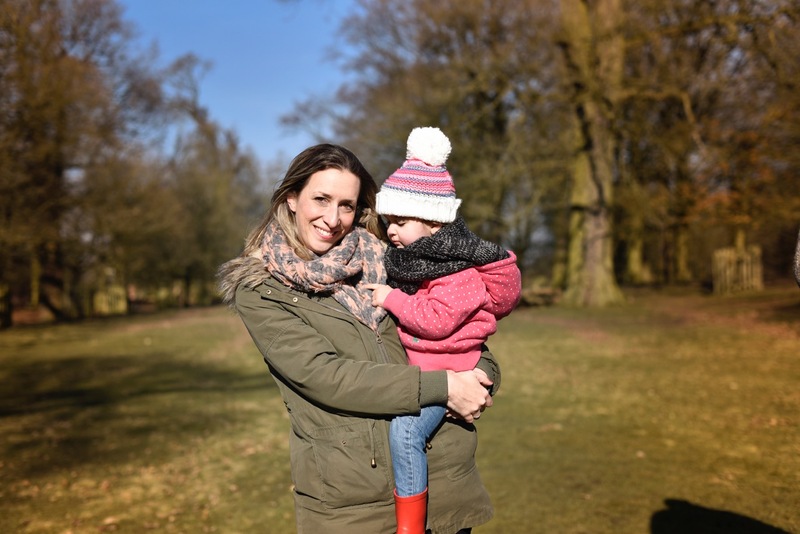 What is the best thing, and the hardest thing, about being a mum? The best thing is now that Phoebe can talk, she tells me I’m her best friend. I can actually have a conversation with her. I’m constantly amazed at her language and how much she understands! The hardest thing is the lack of sleep and the lack of personal space while trying to sleep – she appears in our bed at some point most nights! No…I like to think I could be but John is the romantic one! He always gets it just right with presents or the little gestures. Not annoying at all! I’d have to say my first ‘official date’ with John. We met online so had stalked each other for a while on Facebook, then started chatting. We met up three times before the official date, and he’d even met my friends. Then when we were due to meet up he told me to bring a jumper. I spent all day wondering what he had planned, so when we set off on the motorway I was a bit confused. A friend was texting me to ask if I knew his car registration! We ended up in Blackpool for the illuminations, and he had a convertible so we had the top down – that’s why I needed a jumper! What was the inspiration for starting A Year Of Dates? The idea was born from a Christmas present from John. He made me a date jar containing over 70 sealed envelopes – he kept thinking of better ideas so just kept adding them in. The idea was to open one a week and do what the card said. It was brilliant for making us make an effort. It was pre-Phoebe so we’d meet for dinner after work, go to the cinema and come home to candlelit dinners! Fast forward 18 months and I was on maternity leave. I told a friend about the gift and she had the same response as everyone else: “I wish I had time and the ideas to do that.” And I had a lightbulb moment! We used our savings to buy enough stock for 100 sets and planned to sell them at craft fairs and markets in the run-up to Christmas. At the end of September 2016, I attended a Pitch Up session for Not On The High Street, they signed me up as a partner and I’ve not looked back. What’s it really like to run your own business alongside having a family? It’s tough! You find ways to speed up jobs and I often work into the evening but I love it. Until recently I had a part-time job in a design agency as well. I left there in April as we realised I needed the time to grow the business and get out to events and courses. I have no idea how to run a business so I now have an advisor and have been taking part in a business development programme. Was it a tough decision to give up your day job? The dream had always been to be self-employed by the time Phoebe started school, so the fact I have been able to do it two years earlier is amazing. Giving up the day job was scary but it was absolutely the right time and we could see the potential if I gave it my all. Which is your favourite product from A Year Of Dates? That’s like asking which your favourite child is!! I think it would have to be the New Parents box at the moment. It was a seed of an idea that I just ran with and I’m so pleased with the result. When you have a baby everything changes and your life is focused on this new little being, rightly so, and the people you were before can get lost. Once I had the idea it just felt like a great gift for new parents because, let’s face it, the dad is often overlooked! Each box has 26 envelopes. The idea is one a fortnight but really it’s whenever it feels right! They are a mix of things you can do at home while the baby is asleep, days out where baby can go too, and five silver envelopes which require a babysitter. Each order is colour-coded – cream things to do at home, silver for a babysitter and a choice of pink, blue or purple for getting out of the house. A portion of each sale goes to The Smile Group who support families dealing with PND in Cheshire. What one piece of advice would you give to new parents? Take your time. There is no rush to get out to groups, have visitors or do anything until you feel ready. Just because other people look like they are out swimming and having days out, don’t feel pressured. Aside from your husband, who would be your dream date and what would you do? James Corden – and we’d have to do carpool karaoke! Do you think your relationship can ever be the same after having a family? I think it takes time but yes. It’ll never be exactly the same because you mainly talk about the kids! We’re two and a half years in, and we make an effort to go to gigs and have nights out like we used to. Do you and your husband always make time for date nights? We try, but the irony of this business is that we are often working on it in the evenings! We do try though – the original date jar is still sat on a shelf and every so often we take out a card and book a babysitter. What advice can you give to busy mums who don’t feel they have enough time or money to book in a regular date night with their partner? You don’t have to get dressed up and go out! Most of the date cards are things you can do at home, like make a playlist together or watch the sunset. You just need an hour or two when you’d be scrolling Instagram or watching TV. Of course putting on your best clothes and going out for dinner is lovely too but it’s not realistic every week! We have a colour-coded date box so you can plan the type of dates you choose in advance. Dating the father of your child/ren shouldn’t be a chore!! Whoop, it’s time for a giveaway courtesy of the fab A Year Of Dates! Enter below to win your very own ‘Box of Dates‘ from A Year Of Dates – worth £25! Good luck lovelies! What a fantastic idea! I know as a parent, date night is sadly something that doesn’t happen anymore, so this is fantastic! I know, it’s so hard to fit date night in but so important to try and plan it if you can! Lol, hope you have a good time whatever you end up doing! Exactly, I love that you don’t have to do any thinking, just the doing! Date night…. not had one in six years but wouldn’t change it for the world. If we had one it’d be close to home, probs a small restaurant or the cinema (to see a grown up film) or picnic on the tailgate by the beach. Wow, six years! That sounds lovely, hope you get to have one soon! I would go somewhere really peaceful and beautiful, maybe a summer meadow at sunset with a blanket or two, some cushions, decadent picnic food, a little wine and a radio playing Motown where we’d sit and watch the sun set and the moon rise and talk and kiss endlessly like we used to do when we first met. A romantic, candlelit dinner at our favourite restaurant. To go to the cinema and the out for pizza. I think I would just go bowling and for pizza afterwards. Been a long time since we went on a date night. I went on my dream date recently. I’ve always wanted to go on a date to the zoo and it was amazing! my dream date would be a day at a fun fair followed by a romantic stroll down the beach and a picnic on there in the moonlight!! An Italian restaurant so I could see how they ate spaghetti. Manners are important, but so is enjoying good food! I’d love to go on a ghost walk! I’d love to go to Paris and see some of the sights. My dream date would be camping out in the countryside under a sky full of stars. Cooking food together under a canopy and cuddling up with a campfire. Sounds cliche but camping always brings the worst out in people so you would get a good idea of what your (possible) other half would be like in a bad mood because the air bed has a puncture! I know we’d do something silly like ice skating, bowling or bingo lol! Fun to pretend we don’t have responsibilities for a few hours, we haven’t done this in ages, thanks, we’ll be doing a date night next week now!! We would go somewhere quiet and screen free – need to leave the house then! Picnic on the beach would be lovely! A walk around the Magic Kingdom in Florida, on a warm evening. What a fantastic idea! My dream date would probably be a nice meal out at our lovely local Italian restaurant, followed by a walk under the stars. A walk along the beach as the sun goes down, with a bag of chips would keep me happy. My dream date would be to go to the restaurant in Japan where we had our first date (and other memorable dates, including my husband’s proposal). I really want to save up to take a trip back there. Such a good idea – it’s really important for us to spend some loving time together. I think our perfect date night would be a nice restaurant and then a long walk, just chatting and enjoying each other’s company. I would love to go to London for a special day – we would go for a picnic in Hyde park before taking a shopping trip in Oxford Street. We would then go for some dinner before catching a west end show. I would love to go to New York and drink Cocktails! Omg this idea is flippin amazing. Me and hubby had our 1st weekend away for 6 years this weekend and it was AMAZING. it was hard remembering how to be just us 2 and for me not go keep looking at my phone at the kids pictures but this I need!! I do love a good meal out, and recently enjoyed a meal at Mowgli, Liverpool. I’d love to go back! I’d love a spa date. Somewhere my husband and I could relax, child free! Amazing! My ideal date is going back to where we had our wedding (and so far we have been back every year for our anniversary dinner). It brings back such special memories. The Caribbean for cocktails! Or would like to try the restaurant at the Shard. I’d go to bed for a smokin’ hot night in. I would go to the beach (in perfect weather, obviously!) and walk along the shoreline together eating fish and chips! My dream date would be to a West End musical followed by a night in a lovely hotel. A midnight feast in a park with lanterns and the blue moon above us would be lovely and relaxing! Liiiiiittle bit extravagant as a ‘date’, but really just a quiet moment alone on the Galapagos, if I could have anything. To be honest…anywhere…as long as my partner plans it….in the 10+ years we have been together we have never actually been on a date!!!! I cant remember the last date I ever had with me partner so any date would be amazing. This is such a lovely idea, so romantic! Mine would be camping under the stars! My dream date would be a day trip to Disneyland Paris! A dream date would have to be somewhere that you’d remember forever so maybe the top of the Empire State Building. I would go to a theme park to get my adrenaline pumping on the date! A trip to Las Vegas with a LOT of money to spend on great food, great shows and some gambling. The perfect date for me would be at the top of the Eiffel tower while it’s snowing. Odd I know! My ‘dream’ date would be under the Northern Lights, taken there by husky sled, sleeping under the stars in a glass igloo….What a dream though!